Surprise! All the parts were included. I am concerned about the table top bowing. It was easy to put together but do notice a slight bowing in the middle. I have used teak oil on all the pieces I received and plan on reapplying mid-summer. I'd also suggest either covering the table or storing during the winter months. I never left my small teak table/chairs out in the winter and they lasted 15 years with annual oiling. 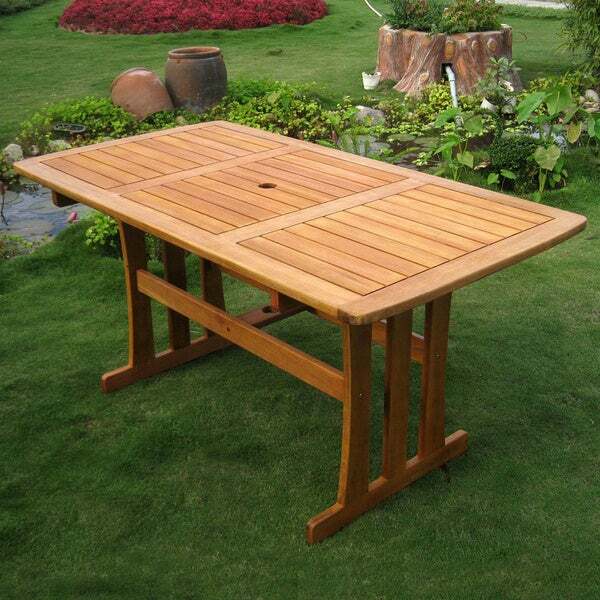 The Royal Tahiti patio dining table is made from Balau Hardwood which is rated similar in strength and durability to Teak Hardwood. Balau Hardwood is an excellent wood for use in Patio Furniture due to its high density and naturally oil rich composition both of which contribute to the longevity and durability of products made with this hardwood. Effortlessly upgrade your porch or patio with this sturdy dining table. Crafted from wood, this durable table features a three-legged design that is built to last, and its attractive finish will look great in virtually any room. Your friends and family will love the functionality and elegant appearance of this stunning Royal Tahiti dining table. This table sports a center hole, allowing you add a patio umbrella to provide extra shade for guests. The gently curved edges of this outdoor dining table help ensure safety and prevent snags when you're maneuvering around the sides with a full plate of freshly cooked barbecue chicken or a tub of boiled shrimp. This does appear to be a nice little table. It is slightly smaller than advertised; again they measured the box. You must use a 000 paper and sand off all the so-called finish. Then use Minwax Helmsman Spar Urethane finish in 3 to 4 coats to just make the thing last. Other than that, a very nice little table. The scratch it arrived with disappeared under normal treatment anyway. A very sturdy and good looking table, this was an excellent buy. I looked at hundreds of outdoor dining tables, and am happy with this choice after the first few weeks. It is smooth to the touch, a great color, like teak, and the top has slight gaps between the boards to keep water from pooling and making it easier to clean. It easily accommodates six chairs, all with arms, and could take two more without being uncomfortable. We are keeping it under a canopy on our deck, and I think it will hold up very well. We've had rain almost daily and the table has remained smooth and unchanged. I had planned to seal it, but because the color is such a perfect match to our deck, I am putting that off for a while. There were no care instructions with the table, but I think treating it like other wood patio furniture, meaning not abusing it and putting it in inside winter, is all it will need. I also like the design of the legs, so that there is plenty of room for legs and chairs. It took about 7 days to arrive. Another great overstock.com purchase. We purchased this outdoor dining table and 4 chairs. The set looks very nice and is easy to move. Excellent quality for the price. The table can fit 6 people if needed. This is a great table for 4 and can even get 6 around it in a pinch. It will also hold not only your place settings, but food and table decorations. We have found it to very sturdy and a nice addition to our patio furniture. This table is everything I wanted for an outdoor patio/deck table. It is very sturdy and the color is fantastic. Cleans easily also. With only 8 bolts...how hard could it be! Well, took me over an hour due to extreme difficulty getting the bolts to line up with the nuts you drop into holes and then line up with the bolts. Only got 6 to work. Table stands in one place (I am using it as a small dining table inside, in a cottage. But the "Ikea-style" bolts and hidden nuts are a nightmare. May have to do with degree of precision of the boring of the holes at the factory. the table itself is very nice, but the finish was rough and uneven. after two months of sun and rain, one of the surface pieces has begun to split. i doubt it will last more than a season or two. not worth the money. This is a great table for the price. I didn't have any trouble putting it together by myself. Directions were easy to follow and all needed hardware was there! I did put another coat of polyeurethane on the top - as the table is outside on the uncovered patio in New England! I originally was looking for a white resin dining table to replace an old one. I saw prices ranging from a low of $410.- to over $1,000.- this table was very inexpensive, the quality is amazing and it is much more substantial (holds up the umbrella) than a resin table would be. price was so low, I even got 4 matching chairs and only spent a total of $****.- It arrived quickly and I LOVE IT!!! this table is was smaller then i wanted,the color faded fast. this year it needs a stain on it. was good for the price..
Not the absolute worst junk but by and large on par with IKEA stuff. Don't expect this to last more than a couple of seasons. Heavy duty. Easy to put together. It wasn't too difficult to put together, as I did it by myself. It would have gone smoother with help. I also treated all of the wood with weather proofing before assembling since it will be outside in an uncovered area. The table is nice. On the picture it gives an impression that it is longer. We had similar one that last outside in rain and snow for 15 years. But there are missing holes on the Part B for the cylindrical nuts (part 3) Now my husband has to drill them himself. This table is high quality and a fabulous value. It looks beautiful on our deck next to the pool. This table shipped and arrive very fast. It was easy to put together and looks really good. I am following the advice in another review and intend to put a little sanding to it, and refinish with something bomb proof. I suppose if you put a cover over it, it would be fine! But pretty stoked on this table! The idea is to be able to seat six around it, which it will do easily! Great value for the money. It is perfect for a small gathering. The wood warped ~ the finish did not hold up. I like this table. It came as described, easy assembly and sturdy. I will likely put a oil on it for the coming summers just to preserve it. Easy to assemble, but the instructions are just diagrams without words. Lightweight and easy to move around. The umbrella hold is exact 2", which is the same as my umbrella pole, so I needed a rasp to make it fit. Delivery didn't ring the bell, and left the cardboard packaging in the rain -- if I didn't get home in time, it would have been a problem. Beautiful table, just the right size for four to six people, nice quality and fairly easy assembly, smooth finish with no risk of splinters, Highly recommended. "Product is listed as assembled, yet comments say it was "easy to assemble" Please advise what assembly is required?" It IS necessary to assemble this table. "How much does the table weigh?" "Does this table fold for storage? " This table does not fold up. Does the table rock or wobble if someone leans their elbows on one side while sitting at the table? "Please confirm the dimensions. (Some reviews said the listed dimensions are inaccurate)." "Can this be left outside not under a covered patio?" The table I wanted was on sale and actually sold out while I was looking at your website. This table fulfills our needs seating 6 and having an aperture for an umbrella pole. I am thinking I may order another one as soon as I see this one. sturdy looking - umbrella hole top and bottom - nice price - beautiful too. this table is listed as "fully assembled" - yet some of the comments refer to it being an "easy assembly" can you explain assembly requirements? "chairs or benches to match"
Hello medowntown, this item comes with many different matching pieces and configurations. To view all the available pieces you can enter "International Caravan Royal Tahiti" in the search bar. Thanks for shopping with us!